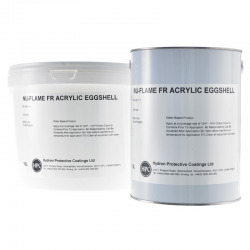 Bollom Flameguard Ultra Primer/Undercoat is for application prior to the use of Bollom Flameguard Ultra Topcoats on bare and previously painted non-combustible surfaces. Colour reproduction of the Products on the Site is limited by the technology used to deliver web pages and by the colour representation of Customer’s own monitor and computer set-up. We have made every effort to display as accurately as possible the colours of our Products but we cannot guarantee that the colour shown on Customer’s monitor’s display will accurately reflect the colour of the Product on delivery. We recommend that Customer first purchases the smallest Product available or access an industry standard colour chart in person (and not digitally) to ensure that the colour is acceptable for its purposes. For more information, please see our Terms & Conditions of Sale. 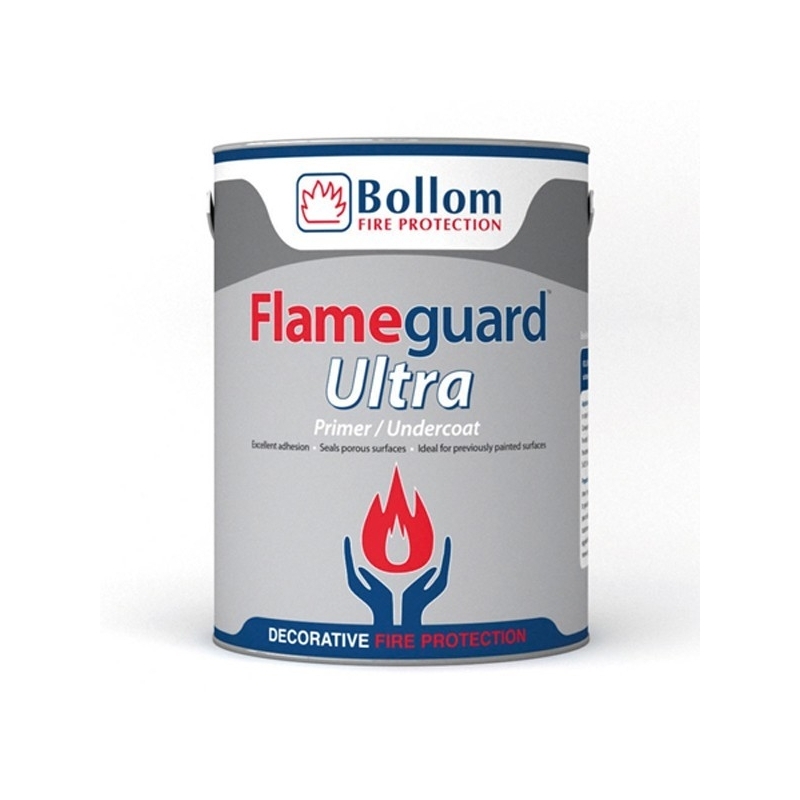 Bollom Flameguard Ultra Primer / Undercoat is for application prior to the use of Bollom Flameguard Ultra Topcoats on bare and previously painted non-combustible surfaces. Ensure the surface to be painted is sound, clean, dry and free from grease or any substance liable to give adhesion problems. Scrape off any old or flaking paint until you have a firm well adhered surface; if in doubt remove all existing coatings. For existing gloss and eggshell finishes wet abrade and rinse with clean water to remove any residues. Applied by brush or roller. 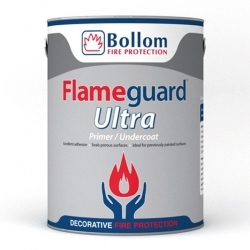 Bollom Flameguard Ultra Primer / Undercoat must not be thinned. Coverage rates must be adhered to in order to achieve the fire rating. Throughout the period of application and drying the ambient and substrate temperature should be between 5-30°C with ambient relative humidity below 75%. 12m² per litre / per coat. One coat required. 4hrs @ 20°C per coat. Allow to dry for a minimum of 4hrs @ 20°C before applying Flameguard Ultra Top Coats. How do I get Fire Certification? It’s simple, just keep proof of purchase, batch numbers of the products used along with site details and contact the Customer Services Department on 0191 410 6611 with the information and they will send you the relevant Certificate of Supply within 5 working days. IMPORTANT FIRE PRODUCTS NOTICE: The information displayed on this website should be used as a guide ONLY and our Technical Department should be contacted to obtain a tailored specification and any advice necessary before you place an order for fire protection products. Fire protection products are non-returnable except in accordance with Condition 8 of the Terms and Conditions. We will not be held liable for any resulting damage to property, human life or monetary costs incurred due to the incorrect specification you have prepared or use of fire protection products caused by your negligence, including your failure to have contacted us to obtain the relevant advice/specification. It is your responsibility to read the Product Data Sheets (available below) before you place an order and prior to application of the product. The content of this website is our best recommendation and is not advice. Coverage rates quoted are approximate, you agree that coverage depends on the condition of the substrate, surface absorption, texture and application method. We ALWAYS recommend a trial area is coated to ensure the product meets your requirements before use. Customer agrees that before placing an Order, Customer has read and understood the most up to date Product Data Sheet for the Product. Where we have access to the Product Data Sheet from the manufacturer, we will either provide a copy on request, or include a link to the Product Data Sheet available on the manufacturer’s website. Customer further agrees that we have no liability for any errors or omissions contained within the Product Data Sheets. For more information, please see our Terms & Conditions of Sale. Envirograf HW Superb Clear Top Coat is a tough, long lasting, extra hard wearing solvent based top coat that offers a superb robust and easy to clean surface. This coating offers excellent UV protection and is available in Matt, Satin or Gloss finishes. Envirograf HW05 Clear Top Coat is a clear, solvent based, hard-wearing top coat for use over Envirograf HW02E Clear Intumescent Coating and Envirograf ES/VFR Clear Fire Protection Coating and Envirograf QVFR Clear Fire Protection Coating. It forms a very hard surface, two coats make it suitable for surfaces which are liable to be damaged through hard wear. 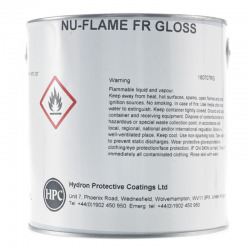 Nullifire TS134 Acrylic Polyurethane Top Seal is high-gloss High-Solid polyurethane Topcoat, which can be easily sprayed with conventional as well Airless equipment. Product has excellent flow and application properties which provides a smooth, durable and easy to clean surface. Envirograf HW Enviro Clear Top Coat is a specially formulated, quick drying, water based protective top coating for INTERNAL smooth hardwood and softwood surfaces. It can be applied by brush, roller or spray and it comes in either a satin or gloss finish. 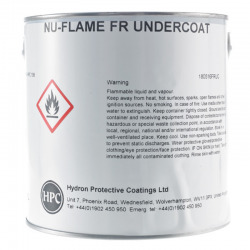 Nullifire FC450 Fire Retardant Antibacterial Wall Coating is a fire retardant wall coating with additional antibacterial protective and decorative performance for walls and masonry structures. Envirograf HW Translucent Top Coat is a spirit based wood stain to apply over Envirograf HW02E Clear Intumescent Coating. Available in a satin finish and suitable for internal or external use.